A storm was expected in northern Colorado the week of Dec. 10, with several inches of snow expected. 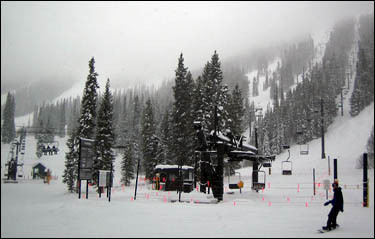 After December 2005’s early storms, which produced large quantitites of snow across the Colorado Rocky Mountains, another storm was welcome news for skiers. Off from Denver I drove to meet it, by way of Mary Jane and Steamboat. I encountered a blustery, foggy storm that blew into the Frazier Valley on Dec. 13, dropping a few inches of new snow on the slopes of already well-endowed Mary Jane. While part of the larger Winter Park resort, I tend to consider Mary Jane a separate ski area with its own character and vibe. In many ways, Mary Jane clings to the pre- “world-class-mega-resort” evolution of Colorado ski areas. Three old double-chair lifts serve the area (in addition to a six- and three-person chair). The double-chairs creak slowly up the hill, just like in the old days. While you can catch wind-burn riding the speedy, Super Gauge Express chair at the base of Mary Jane, old timers appreciate the leisurely pace of the Challenger lift, which provides passage to fast-and-furious glades, moguls and steeps. Black runs at Mary Jane are definitely black (unlike the milder, tourist-ego-boosting black runs elsewhere) and are usually long and taxing, making the slow ride up welcome. However, on this day, only the six-person chair was running at the base of Mary Jane, initially a disappointment for me. As it turned out, though, this meant that a lot of terrain served by the Iron Horse and Pony Express lifts was not being skied. Ever the opportunist, especially in familiar territory on a powder day, I quickly remedied this situation. Access to these runs is a little tricky from where the Super Gauge lift drops skiers off at the top of the hill, necessitating a careful reading of the trail map. These runs, Narrow Gauge, Upper Arrowhead Loop and Golden Spike, were deserted and wre worth several descents. The trio represent classic Colorado black-run skiing — steep, with large moguls and tempting glades on the borders. It had been quite some time since I’d last tested my mettle on these runs as Iron Horse lift, the main access, is rarely open on weekdays, my preferred time to visit Mary Jane. Reacquainting myself with these venerable trails (blessed with great snow considering the date) justified the trip over Berthoud Pass from Denver. The frosting on the cake was the fact that the usually mild blue-black runs of Rainbow Cut and Lower Arrowhead Loop were also nearly empty, with large stashes of untracked powder adding a nice challenge to the descent. Ungroomed, these runs contained nice, medium-size moguls, perfect for a fast blaze through the powder. 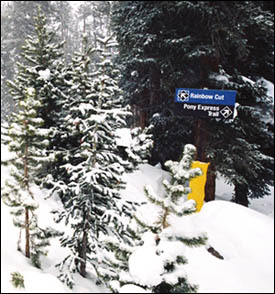 There’s a popular bumper sticker in Mary Jane parking lots proclaiming: “Don’t groom Mary Jane – God.” For the most part, the resort complies, meaning much of Mary Jane’s blue or intermediate terrain gains mid-size moguls, making them a bit more challenging. The message of this day, however, was: Lift closures can be good! Despite its well-deserved reputation as an expert’s haven (one look at the long, narrow and mogul-laden Drunken Frenchman and Outhouse from the base runs drives this point home) Mary Jane also is home to two fine, long intermediate runs — Sleeper and Mary Jane. When the mountain is crowded, these runs are best avoided — but during low season, these runs can be guilty pleasures. On this day, with the foggy weather keeping many skiers indoors, the Mary Jane trail was sweet, sparsely populated with small moguls forming on the wide boulevard. A rare treat. For the most part, Mary Jane’s pleasures are hard-won, as challenging black slopes with tons of moguls snake through this side of the Winter Park. This rugged side of an expanding resort stands on her own as a great ski area, cloaking the fact that she’s part of the larger, expanding corporate borg.